From rough-hewn to refined, concrete countertops have moved beyond the drab slabs of the past. Advancements have catapulted concrete into the world of architectural-grade products, alongside popular stone and wood options. 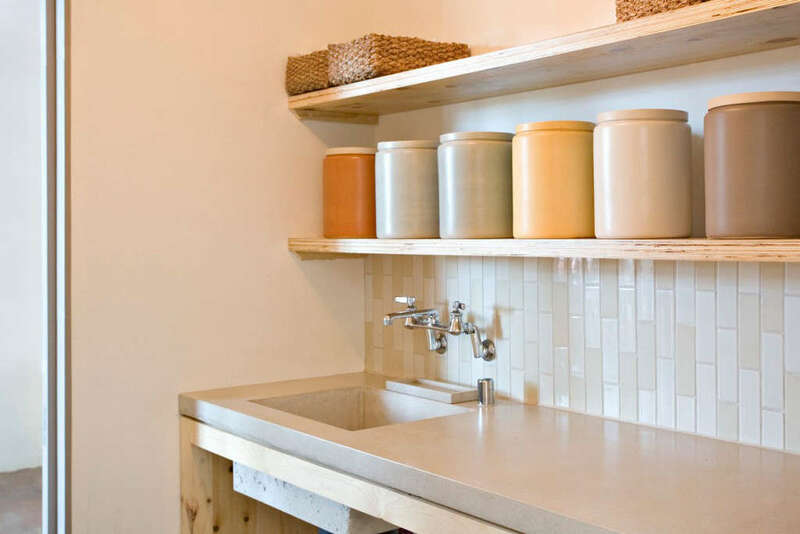 A concrete countertop is a serious contender for those seeking a customized material with a natural sensibility: It’s widely adaptable but definitely not for those who cherish perfection. Is a concrete counter the right material for you and your kitchen? Read on. 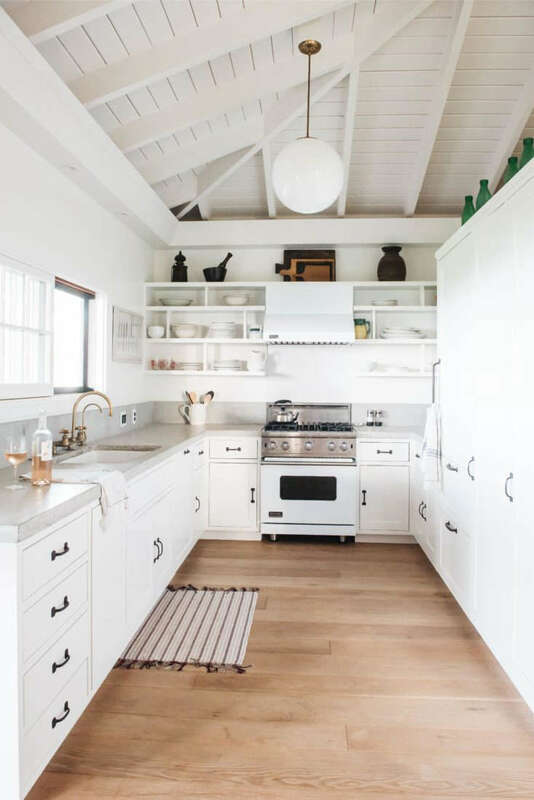 Above: In the retro-modern kitchen of a beach cottage in Hawaii, New York–based architect Roberto Sosa opted for a poured-in-place concrete countertop (and backsplash). Concrete is a natural composite material made from an aggregate (typically rocks, sand, and fly ash) plus a cement binder (such as limestone and calcium sulfate) and water. (For those wondering what the difference is between concrete and cement, the answer is that cement is a component of concrete: Sidewalks are made of concrete, not cement.) Several companies offer sustainable versions of concrete composed of high percentages of recycled content, including waste fly ash, glass dust, and rice husks. The finished product weighs about the same as granite. “Unlike concrete counters of the past, the new concrete counters are lighter and some have polymers mixed in, so they don’t stain or crack,” says architect Alissa Pulcrano of Portland, Oregon’s Bright Designlab. 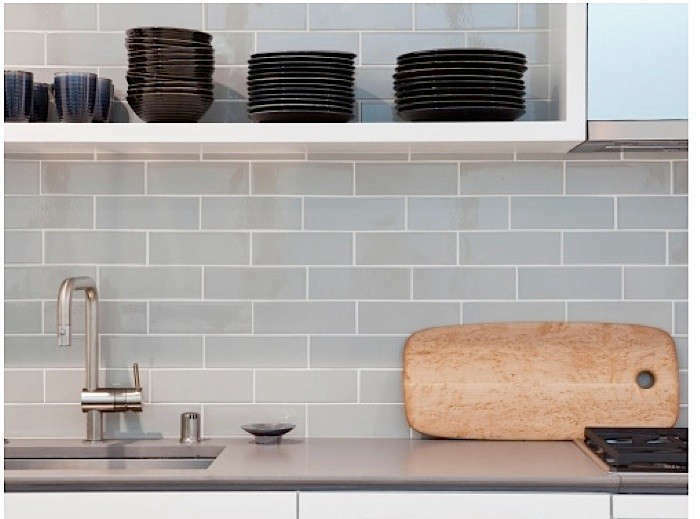 Above: A slender concrete counter with a delicate-looking edge detail by Concreteworks of Oakland, California, in a project by San Francisco architect John Maniscalco. Mark Rogero, principal of Concreteworks, explains that of late there’s been “a major shift in reinforcement technology—we use fiberglass reinforcement in surface concrete that has made it stronger, thinner, and more refined than the steel-reinforced concrete of the past.” Now concrete counters can be as thin as three-quarters of an inch. Photograph by Mariko Reed, courtesy of John Maniscalo Architecture. How is a concrete countertop fabricated and installed? 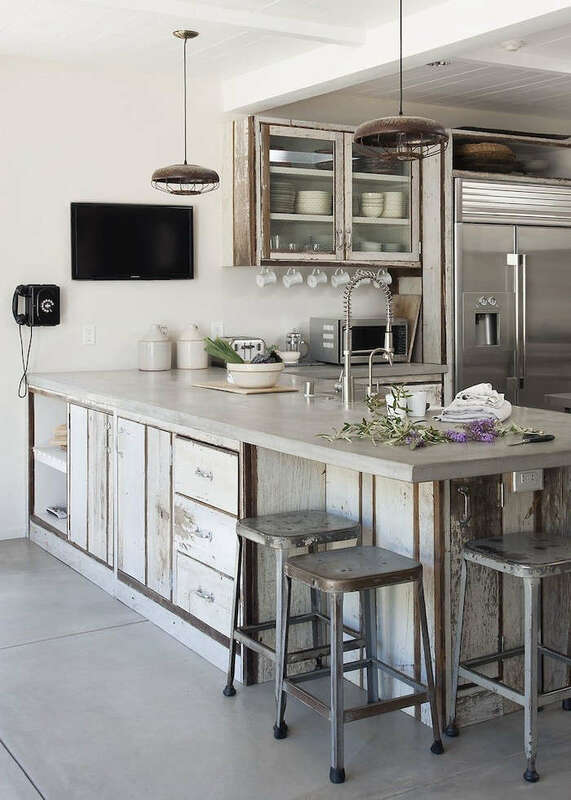 Above: Not reserved for rustic or industrial settings, concrete counters are amazingly versatile. 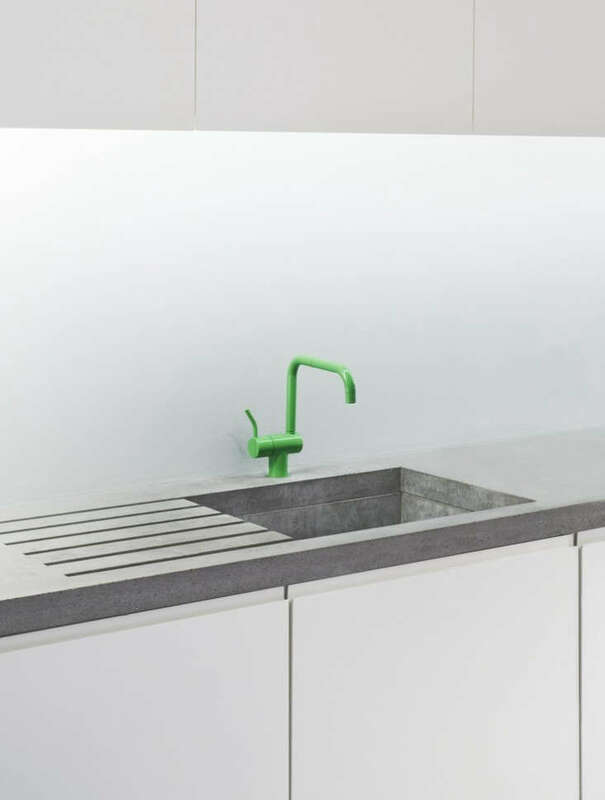 A custom concrete countertop fabricated by Lowinfo for a London architect is animated by a lime green Vola faucet. Concrete counters are either precast in a shop or cast in place during your kitchen construction. The majority of today’s concrete counters are precast—and for good reason. Made to order in any size you like, precast counters are poured in the controlled environment of a shop, enabling more color and texture options as well as the ability to use modern reinforcement technology (more on that below). Each counter is handmade, enabling customization of shape, thickness, sink, and appliance cutouts, and additional details such as an integrated dish drainer. Precasting also offers the ability to create a wider range of counter edge options than you can make on-site. An identifying sign of precast concrete counters is that they come with visible seams, which is not necessarily a bad thing: Seams enable the counter to flex and move a bit more, reducing the likelihood of cracks that occur with concrete’s natural shrinkage over time. Counters are often cast in place in setups that require irregular shapes. And when poured on-site, counters typically do not have seams. Ambitious DIYers can try making their own; there are scores of how-to videos on YouTube and other sites. 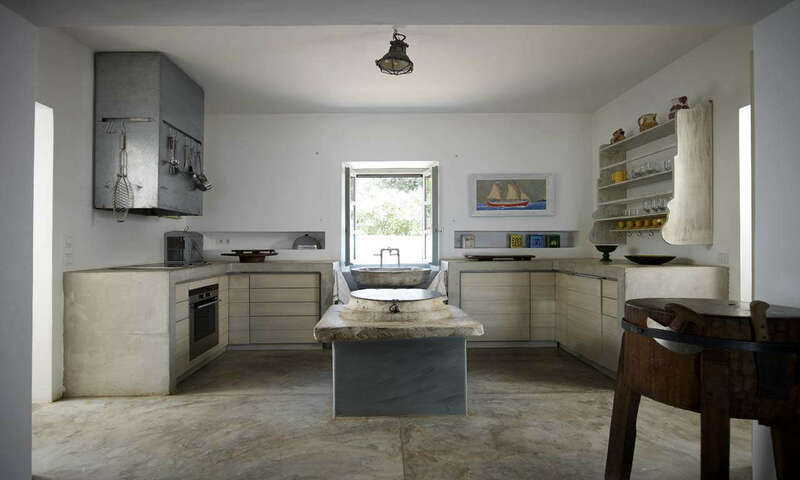 Above: “I tried to make the entire kitchen in one finish: The poured concrete on the floor climbs and creates the worktops,” says architect Theodore Zoumboulakis of the kitchen in his house on the Greek isle of Hydra. “This finish is very simple, the simplest it could get, and seemed appropriate for the arid rocky surroundings and beach.” Photograph courtesy of Zoumboulakis Architects. What colors and textures are available for concrete countertops? Concrete countertops can be made in virtually any color, though stony gray continues to be the most widely used. 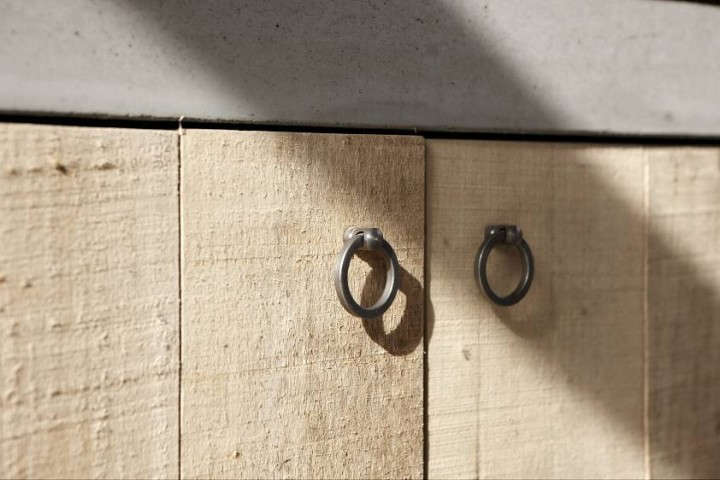 Concrete finishes range from rough-hewn to diamond-polished. That said, there are natural variations in color and texture that occur as the counter is crafted and cured; to concrete advocates, it’s one of the material’s appealing qualities. Above: Detail of the heavy concrete countertop in the kitchen of the Heerlijkheid van Marrem farm in Belgium. Photograph courtesy of Heerlijkheid van Marrem. Does a concrete countertop need to be sealed and maintained? Like most natural countertop materials, concrete is porous and needs to be sealed to prevent staining. And, depending on the sealant used, some discoloration and patina may develop—a chance outcome that’s appealing to some, appalling to others. Sealing technology is now so advanced that some fabricators call their concrete counters stain-proof, and provide warranties against staining. Talk to your fabricator or contractor about the best sealant for the look you want. Maintenance is minimal with concrete countertops: Regular cleaning with nonabrasive cleaners is recommended, as is periodic waxing if your counters have a polished finish. Placing hot pans directly on concrete counters won’t harm the concrete, but may discolor the sealant. Also, cutting directly on concrete will not only damage your cutlery but also may result in scratches in the sealant; cutting boards and trivets are recommended. How much do concrete counters cost? Handcrafted and custom made for each application, concrete counters are not a budget item. Because of the variability of material and situation, prices range from $70 to $140 per square foot. According to Mark Rogero of Concreteworks, a good rule of thumb is to plan for $120 per square foot for a fully installed architectural-grade concrete counter. Above: Concreteworks counters include sustainable concrete blends with high recycled content, such as fly ash and rice husks. Pictured above is the kitchen at Heath Ceramics in Los Angeles. Concrete counters are a custom handmade product that you can design to fit your space and aesthetic. Concrete is available in a wide array of colors that can be adjusted to match your palette. Despite being a hard surface, concrete provides a soft, textured, natural feel to counters. Properly sealed and maintained, concrete countertops will wear well for years—and can be used indoors and out. Like other natural countertop materials, such as wood and stone, concrete counters develop a patina with use. Concrete is a porous material and can stain. Sealing is key. Caused by the natural shrinkage of the material, concrete countertops can develop minor hairline cracks that are nonstructural—some consider these a flaw, others a positive textural characteristic.